Laser therapy offers a safe, targeted tool for stimulating the body’s own natural healing response. When cells in the body absorb light emitted from the laser, this triggers a cascade of activity at the cellular level. One effect is increased generation of ATP (energy) within cells. This energy accelerates and enhances the healing process. Another effect is increased production of Nitric Oxide (NO), which dilates blood vessels and promotes pain relief. This vasodilation limits the harmful effects of inflammation and helps bring oxygen and energy to injured issue to facilitate the healing process. What kind of laser system does Dr. Harrison use? Laser therapy offers a safe, targeted tool for stimulating the body’s own natural healing response. Dr. Harrison uses the MR4 ACTIVet laser which is a handheld superpulsed laser. Superpulsing allows for delivery of a large wattage of energy without risk of burning the skin. This burst of power emitted from the laser allows for deep penetration of light into the body. Dr. Harrison’s state-of-the-art laser unit allows her to provide extremely fine-tuned and varied types of treatment to your animal. The client rental units—also MR4 ACTIVet lasers—are simpler and easier to use so that clients won’t have any trouble operating them. Will my pet and I have to wear protective eyewear? Is there any way I can hurt my animal in the process of administering a laser treatment? The MR4 ACTIVet system is a Class 1M laser meaning there is no risk of damaging your eyes or your animal’s eyes during use. Goggles are provided if you are more comfortable wearing them but are not required for safe operation. Because this is a Class I M laser, there is no risk of burning your animal’s skin or doing any thermal damage. What kinds of conditions may respond to cold laser treatment for my dog or cat? What kinds of things can the cold laser be used to treat in my horse? Lameness stemming from arthritis, bowed tendons, quarter cracks, etc. Is the laser easy to use? The MR4 ACTIVet laser is easy to use and painless. Most protocols will involve contacting the skin and moving the rubber-coated laser over problem joints or painful areas. Many owners will elect to treat their dogs while the dog is already laying down. Horse owners will most likely find treatment easiest with the horse standing on cross-ties. The treatments are well-tolerated and your animal will likely relax and enjoy the process. The MR4 ACTIVet units are designed to be rented out on a weekly basis (7 days). If rental is combined with acupuncture treatment, there is no additional fee for Dr. Harrison to tailor a treatment regimen for your animal. 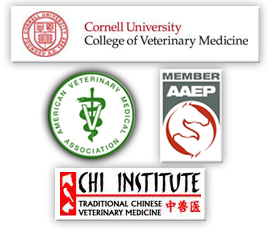 If your animal is not receiving concurrent acupuncture treatment, there is a fee for the initial assessment so that Dr. Harrison can get to know your animal’s medical history and come up with the best plan to help him or her. It is the client’s responsibility to return the rental unit safely to Dr. Harrison at the end of the rental period. How many times during the weeklong rental period should I expect to be administering the cold laser therapy to my animal? Each animal’s needs are different but most treatment protocols will involve 1 treatment per day, generally lasting between 10 and 15 minutes. Most protocols involve 6-8 treatments but some animals may benefit from up to 14 treatments to address a specific problem. 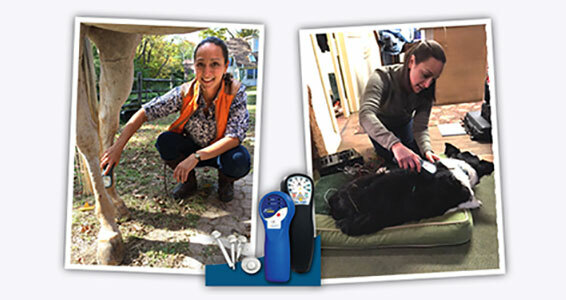 What if I have multiple animals who would benefit from the cold laser therapy or want to share it with a friend? The rental fee is weekly, whether you are using it on 1 dog or 4 dogs in your house, 1 horse or a barnful of horses. If multiple owners want to pitch in, the cost per animal per week drops significantly for the same product. It is the responsibility of the individual who rents the unit to return it in the same condition in which they received it.